Kou Taiki, Kou Yaten and Kou Seiya are elated to see Princess Kakyuu after she has been released from the incense burner that Chibi Chibi had been carrying. She is also very happy to see them, and tells them that she has heard their voices and wanted to go to them. Unfortunately, it had taken her longer to heal than she had thought it would. Chibi Chibi saved her and also told her about the Three Lights and Sailor Moon. Seiya is curious once more about who Chibi Chibi is, and Princess Kakyuu turns to Chibi Chibi and tells her that she senses the power of stars in her. She asks Chibi Chibi if she is also a Sailor Senshi. Chibi Chibi then shouts the phrase "Chibi Chibi Crystal Power, Make Up" and in a flash her outfit is transformed into sailor fuku, complete with small wings. Unfortunately, in another location, the newest Sailor Animamate Sailor Tin Nyanko has sensed the power of Star Seeds similar to the power from her home planet. She is after Artemis and Luna, calling them traitors. When she attacks, Luna and Artemis take on human forms and escape from her on the rooftop of the school. Tin Nyanko follows them and Usagi witnesses the chase, transforms into Sailor Moon, and goes after her to help her friends. On the rooftop, Tin Nyanko uses her attack "Galactica Puppet," which Luna, Artemis and Sailor Moon all get caught up in. Tin Nyanko introduces herself and Luna is very angry with her for using the holy name of a Sailor Senshi. Artemis is equally upset and asks why people of Mau would sell their souls to a stranger. Tin Nyanko tells them that they don't know anything and that they also betrayed the planet Mau. She tells them that Mau is gone, destroyed by Shadow Galactica. Luna and Artemis are stunned and Tin Nyanko gets very upset with them. She tells Luna and Artemis that she will win the battle so that she can have her bracelets removed, get her real body back, obtain a Sailor Crystal, get her own planet and become a real Sailor Senshi. Sailor Moon realizes that Artemis and Luna are from Mau just as Phobos and Deimos were from their own mother planet. They left those homes to help the Sailor Senshi. Diana in her human form appears and tries to stop the battle, saying that they are all from the same planet. Luna and Artemis are surprised to see her, but Tin Nyanko wastes no time in blasting Diana forcing her back into her cat form. In 30th century Crystal Tokyo, Small Lady is frantically searching for Diana. Meanwhile in present time, Diana is unable to speak from the blast. Sailor Moon tries to knock some sense into Tin Nyanko, but Tin Nyanko releases another blast of energy which soars past Sailor Moon into Artemis and Luna, forcing them back into their cat forms as well. Sailor Moon runs and catches them but feels they are all in trouble because of her. Just then, Sailor Star Fighter's Star Serious Laser rips through the scene and blasts Tin Nyanko who then retreats. Sailor Moon is surprised to see Chibi Chibi as a Sailor Senshi. Sailor Star Maker takes the cats from Sailor Moon and invites her back to their place. When she arrives, Usagi is introduced to Princess Kakyuu, the first princess of the planet Kinmoku. She informs Usagi that the Three Lights are the Guardians of the Kinmoku system and tells Usagi that she is very happy to meet the future Neo-Queen Serenity. Usagi asks how she knows about that, and Kakyuu tells Usagi that the beautiful light of the new Silver Millennium was felt throughout time and space. She tells Usagi that the cats need to be treated and that their Star Seeds have powers similar to the Sailor Crystals. Seiya reports to Kakyuu that the enemy retreated and might not be under full control of the bracelets. Princess Kakyuu tells Usagi that she must help them. She says that the whole galaxy is in trouble, and that Sailor Galaxia has been using Sailor Senshi to attack planets with other Sailor Senshi. She has been taking the Sailor Crystals and destroying the planets, creating an empire called Shadow Galactica. She tells Usagi that those who had attacked her were not truly Sailor Senshi, and were in fact being controlled by the bracelets they wore. Usagi asks if Kakyuu's home world was attacked and destroyed. Kakyuu tells her that Galaxia is a senshi of destruction, and when she attacks a planet she kills every living thing on it. Kakyuu is caught up in a moment of grief before she tells Usagi the worst of it: every planet and every Senshi up until now has been a warm up for Earth and Sailor Moon. Usagi asks why, and Kakyuu tells her that is is because of the Silver Crystal, the most powerful Sailor Crystal in the Galaxy. Usagi breaks down a bit under the knowledge that all of their problems come back to her and the crystal she carries, but she understands that there will be a battle. She asks where Galaxia is, because she has stolen the Crystals of those closest to her and she plans to get them back. Kakyuu tells Usagi that she will lead the way to the center of the Galaxy. The Three Lights then begin to tell Usagi that this Solar System is very special in the Galaxy. While there are many other planets, there are no systems quite like this one. Taiki tells them that so many stars grow and die out. Usagi is a little confused, but Yaten explains that all living things grow from a Star Seed, including Sailor Senshi. Special Star Seeds become Sailor Crystals and get transported to selected planets to grow with them and protect them. Yaten explains that Sailor Iron Mouse had come from the planet Chuu, protected by Sailor Chuu. It was the same with the others: the planet Mermaid protected by Sailor Mermaid, Coronis protected by Sailor Coronis, and the planet Mau protected by Sailor Mau. Usagi understands and relates it to her solar system: the planet Mars protected by Sailor Mars, Jupiter protected by Sailor Jupiter, Venus by Sailor Venus, Mercury by Sailor Mercury, and the Earth by herself and Mamoru. She is shaken by the thought of him and Seiya goes to comfort her, but Usagi tells Seiya that she is fine and states that the battle with Galaxia awaits. Seiya wonders if Usagi has always carried such a heavy burden. 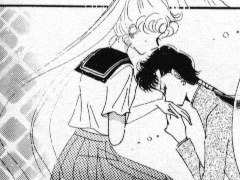 Seiya tells Usagi that Kakyuu also lost her love to Galaxia and then kisses her hand and vows to be by her side to protect her. Usagi thanks Seiya and thinks about her friends and how they would not have met if it were not for her being a Sailor Senshi. She realizes that without her Sailor Crystal she would not have been born. Usagi wishes aloud that their bodies could live forever. Seiya is touched by this and gives Usagi a small kiss telling her that they are just reborn. Seiya offers to take Usagi and Chibi Chibi home but Usagi declines, even though Chibi Chibi would like it. Seiya watches them leave and thinks to herself that Usagi is very brave. On the way home Chibi Chibi takes a detour to the playground, despite Usagi's protests that it is getting late. Usagi reflects that Chibi Chibi is very strange but also quite sweet. She thinks about how she feels like she can communicate with her without even talking, and tells Chibi Chibi that she was surprised to find out she was a Sailor Senshi, too. She asks Chibi Chibi who she is and where she came from, to which Chibi Chibi replies, "I'm me!" Usagi is not satisfied with this riddle for an answer, but before she get a direct answer, the clank of a crystal on the pavement catches her attention. Usagi sees a woman standing nearby and she reaches down to pick up the crystal. She hands it to the woman who thanks her, then tells Usagi that she always has friends around her - that special Sailor Crystal attracts everyone. Then a tremendous blast of energy explodes from the woman and Usagi shields herself from it, amazed at the immense power. She wonders who it is and a vision of Kakyuu confirms her fears: this is Sailor Galaxia. This act contained the first appearance of Sailor Chibi Chibi Moon and her transformation phrase, Chibi Chibi Crystal Power, Make Up, the first use of Sailor Tin Nyanko's attack, Galactica Puppet, and the first mention of the Sailor Wars. This page was last edited on 10 July 2015, at 20:34.